How to weigh the size of a spatial event with respect to the number of its hotspots? This is probably a map algebra problem. I have a 2D map with values ranging 0.0 to 1.0 spread all over it. The algorithm that produces them is an application of the fractional Brownian motion. The map measures 101x101 pixels or cells. Since I must be able to distinguish between the various situations, I was thinking of somehow weighing the total number of cells with respect to the number of islands. 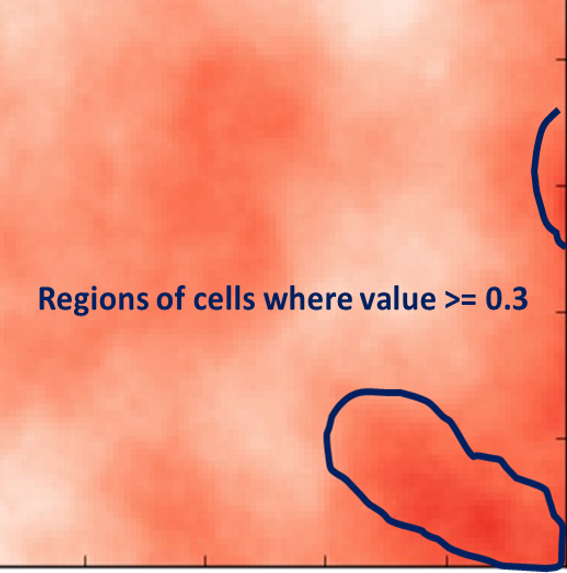 How could I do this, other than considering the average number of cells (which I see as a trivial solution)? I am asking this since if I were to evaluate the impact of those hotspots on a system that is embedded in the map, there might be huge differences between having one big hotspot located in the center of the map and having multiple, although smaller, hotspots scattered all over the place. Below is a visual example of what I mean by islands or regions. Generate contours. You can do this in ArcGiS, QGIS with plugin or even with pure python (but you need to find a proper script or write it by yourself). Generate them with breaks 0.1, 0.2, 0.3 etc. Now all values with 0.3=< are surrounded by 0.3 value line features. Select these lines, create a new layer and convert this layer to polygon. Calculate the min. area of hotspot. Simply get a resolution of raster (V and H pixel size), calculate pixel area and multiply this value by number of pixels in hotspot you want. Iterate by features in your polygons created from 0.3 contour and check if area of feature is greater then a calculated value from point 3. If true, write it to new layer. And now you should have a polygon layer with your "islands". If you need them as lines or points, simply convert to lines or get centroids. This is the simple way, other things that you can do are more complicated, for example Radial Basis Functions are nice tools to classification, or maybe other neural network approach would do the job. Not the answer you're looking for? Browse other questions tagged cartography map-algebra weighted-overlay or ask your own question. How can I stop my map algebra being limited to the size of my smallest raster? How to view a part of the map in natural size using ArcGIS for Desktop? Is there a way of labeling the number of points with the same coordinates? How to create an isotype map, where each symbol represents a number (eg. 50) from data in the attribute table? How to overlay raster with a constant value with another classified raster saving the values from both raster? producing smooth iso polygons from raster surface? How to export a map in lower size (11*17 inch) with all the parameters set up for higher map size but still looking good?